It is critical to know the exact acreage and depth range of your lake to make sound management decisions. Precision GPS lake mapping conducted by The Mapping Network utilizes highly accurate procedures and equipment for data collection. Utilizing sub-foot accurate GPS units and hydro-acoustic depth-sounding equipment, our team logs data points for extremely accurate location mapping. Our clients are able to accurately understand how much water is available in their lake at any number of water levels. Best of all, this information is up-to-date and can be customized to any requirement. Need to know how many gallons of water are available when the lake is at full pool? How about if the water level is down 5, 10, or 15 feet? We can even calculate the amount of water in certain depth ranges (example: volume for 5 to 6 feet). Current, accurate results are our specialty. A GPS Bathymetric Lake Map and Volume Analysis Study by The Mapping Network will help optimize your efforts to manage your lake or pond. Please contact us for more information on how this service can assist you in managing your aquatic resource. 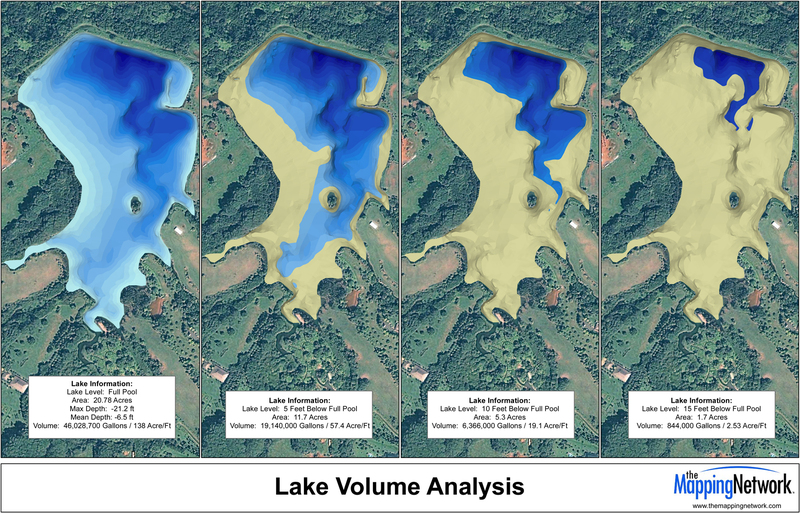 The Mapping Network offers a highly accurate “Volume Analysis” option for lakes. The Mapping Network is an industry leader in Geographic Information Systems Consulting, Data Conversion, and GPS Data Collection. We specialize in terrain and sub-surface (bathymetry) GPS mapping, and recreational Real Estate listings. Give us a call or send an e-mail to find out more details. This entry was posted in Lake Map and tagged California Bathymetry, California GIS Map, Dredging, drinking water volume, Fishing, Florida Bathymetry, GPS lake survey, GPS Map, Invasive Plants Bathymetry, lake, Lake Management, Lake Map, lake map missouri, Lake Mapping, Lake Survey, Nebraska Land For Sale, New York Bathymetry, Pennsylvania Bathymetry, Pond Medics, property or hunting area, Texas Dredging on March 24, 2014 by Moderator. Zorinsky Lake Eradicates Zebra Mussels…For Now. The refilling of Zorinsky Lake has begun after it was drained for seven months in an effort to kill off the invasive zebra mussel. The Army Corps of Engineers closed the gates to the lake Tuesday. Victory has been cautiously declared, but the zebra mussel is notoriously difficult to kill off. The goal behind draining the lake was to freeze out any living mussels. Because dirt clogged access to the drain, the lake was not completely emptied. As a result, it is possible that some mussels survived, especially around the 168th Street bridge, officials say. Read the entire article here: http://www.omaha.com/article/20110714/NEWS01/707149834/1031361. 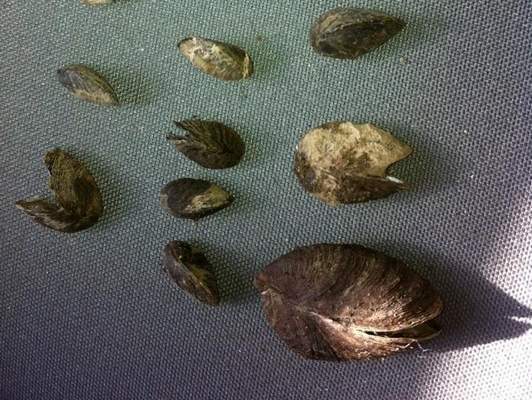 These zebra mussels were found at Zorinsky Lake this winter. The Mapping Network provides the highest quality and is the most affordable bathymetric mapping system on the market today. We specialize in accurately mapping bodies of water, calculating the water volume, collecting sediment depth samples at critical areas and monitoring the distribution of sediment over time. We have a nationwide group of professionals specializing in all facets of lake management. If you are serious about maintaining a high-quality lake or pond, be sure you have the ability to make the best decisions, get your lake mapped by the professionals at The Mapping Network. Give us a call or send an e-mail to find out more details. This entry was posted in News and tagged aerial lake map, Aerial Map, Fishing, free fishing map, free lake map, georgia fishing map, Georgia Lake Map, GPS Lake, GPS lake survey, GPS Map, Habitat, Lake Bathymetry, Lake Management, Lake Map, Lake Mapping, lake of the Ozarks, Lake of the Ozarks Fishing Map, Lake of the Ozarks Mile Marker, Lake of the Ozarks Mile Marker Aerial Map, Lake Survey, lake survey engineer, lake zorinsky draining, Land Mapping, map, Mile Marker Map, Missouri Lake, Missouri Lake Map, ozarks mile marker, ozarks mile marker map, Pond, pond map, Sedimentation, Survey, Texas Lake Map, The Mapping Network, The Mapping Network More stats 0 0 2011/07/18 Published Lake Sediment Mapping Moderator Lake Map Bathymetric Map, zebra mussel, zorinsky lake, zorinsky zebra mussel on July 21, 2011 by Moderator. Greg Grimes with Aquatic Environmental Services, Inc., recently completed a GPS lake mapping project for a client in Georgia. The purpose of this project involved mapping the current lake depths and sediment thickness of the coves for future dredging. The mapping techniques utilized in this project helps Aquatic Environmental Services accurately calculate and isolate areas of high sedimentation for removal and helps the property manager budget accordingly. This powerful information allows for smart management and planning decisions and will serve as a baseline for future projects. Water depth and sediment thickness were recorded on the coves at this lake. Aquatic Environmental Services, Inc offers a wide range of lake management and fisheries management services to residential, commercial, and private lake owners throughout Georgia and the southeast. We have been providing these quality services since 1996. AES has the experience and education necessary to provide unsurpassed lake and fishery services. We have selected only the best products available for resale to our customers. Since the year 2000 we have performed services on over 2000 bodies of water. Aquatic Environmental Services, Inc now has two divisions. Our Lake Management Division (LMD) emphasis is on maximizing the aesthetic appeal of a body of water while our Fishery Management Division (FMD) travels the southeast helping our clients grow big fish. Please visit these pages to find out more specific information on how we can help you with your lake management. Our staff is comprised of three degreed fishery biologists. Mike Rosa heads LMD and has his B.S. in Fisheries from the University of Georgia. Matthew Morgan is supervisor for FMD and obtained his degree from the famed fishery management program at Auburn University. Greg Grimes, President of AES, obtained his masters in Fisheries from the University of Georgia in 1998 at which time he began the expansion of AES that continues today. This entry was posted in Lake Map, Sediment and tagged Bathymetric Map, Fishing, free fishing map, free lake map, georgia fishing map, Georgia Lake Map, GPS Lake, GPS lake survey, GPS Map, Habitat, Lake Bathymetry, Lake Management, Lake Map, Lake Mapping, Lake Survey, lake survey engineer, Land Mapping, map, Pond, pond map, Sedimentation, Survey, The Mapping Network on July 15, 2011 by Moderator. 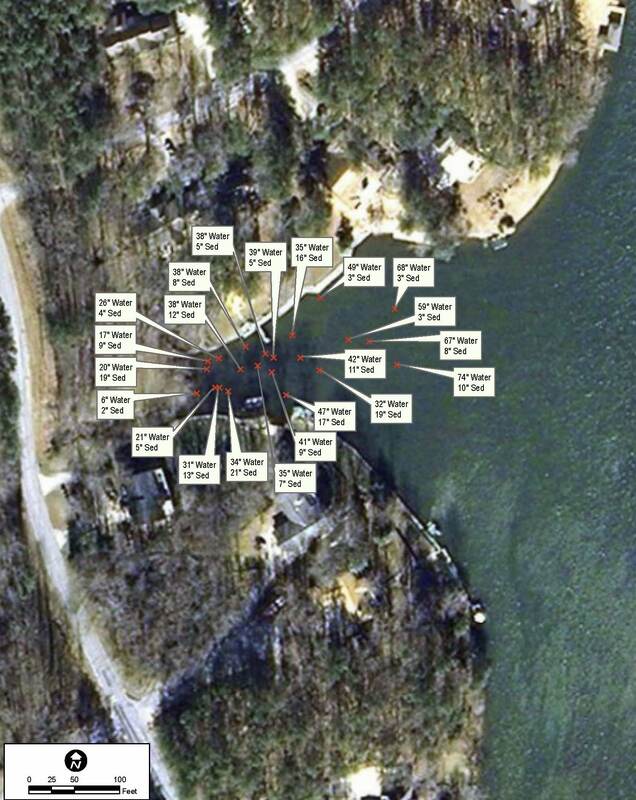 Possessing an accurate map of your lake is a great asset to your fishing success. Greg Grimes with Aquatic Environmental Services, Inc., recently completed a GPS lake mapping project for a client in Georgia. This is a master planned lake designed specifically for growing trophy large-mouth bass. Extensive habitat structure, ridges, brush, feeders, etc were carefully placed during construction. Once the lake was full the client had the lake mapped utilizing The Mapping Network’s lake mapping technology to reveal this unseen, underwater world. Combining sub-foot accurate equipment and depth accuracies of up to 1/10th of a foot, the resulting maps provided a picture of the bottom of the lake. Mr. Grimes was able to provide a map highlighting the ideal fishing zones in the range of 4 feet to 16 feet deep at 1 foot intervals. This lake map shows the angler exactly where the fishing hot spots are located on the lake. If you are serious about managing a trophy fishery in your lake contact one of our lake mapping partners to provide the expertise to make it happen! 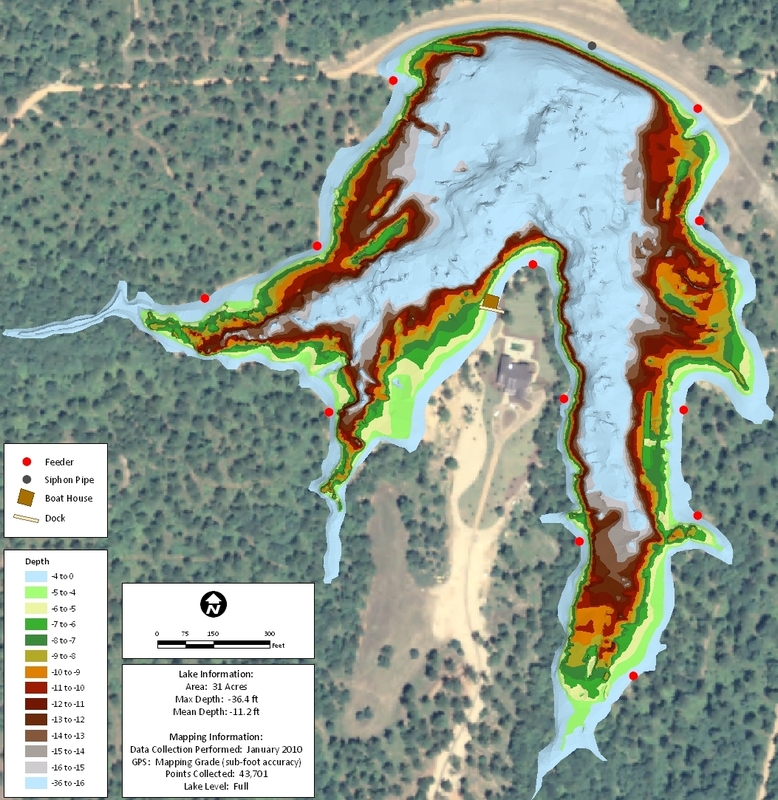 Custom GPS Lake Map Helps Isolate Fishing Hot Spots in the 4 ft to 16 ft range. This entry was posted in Lake Map and tagged Bathymetric Map, Fishing, free fishing map, free lake map, georgia fishing map, Georgia Lake Map, GPS Lake, GPS lake survey, GPS Map, Habitat, Lake Bathymetry, Lake Management, Lake Map, Lake Mapping, Lake Survey, lake survey engineer, Land Mapping, map, Pond, pond map, Sedimentation, Survey, The Mapping Network on January 21, 2011 by Moderator.